“March Madness got you doing the What just happened?” wail? Pizza Hut has the “cure” for you: the P’ZONE, now available on the $5 Lineup in three recipes – Supremo, Pepperoni and Meaty. The pizza restaurant chain has released a series of new commercials to announce the return, 17 years after its debut, of the fan-favorite item and encourage viewers to pick up a pepperoni-stuffed P’ZONE. “That’s right, people. It’s back! 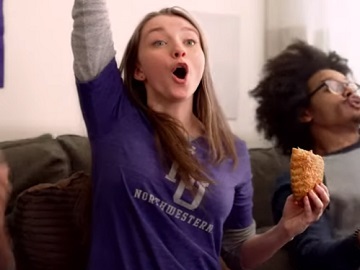 Now, part of the $5 Lineup from Pizza Hut: Official Pizza of March Madness,” the voiceover says on one of the 15-second spots, which features one of the most famous March Madness reaction memes from recent years, the “What Just Happened Wail” with Northwestern fan John Phillips (the 11-year-old son of Northwestern athletic director Jim Phillip). The legendary P’ZONE is filled with savory pizza toppings and melted cheese, baked calzone style, sealed inside a toasted parmesan pizza crust, and served with marinara dipping sauce. Customers can now choose from Pepperoni, Meaty and Supremo recipes. Marianne Radley, chief brand officer Pizza Hut, said in a press statement “March Madness is one of the most captivating sports moments of the year. We are excited to bring back the P’ZONE as part of our $5 Line-up during a time when family and friends will be gathering in anticipation and excitement. Even if your team doesn’t advance in the tournament, the comeback of the P’ZONE is something we know all fans can rally around.” “There is a whole generation of people who have never had the P’Zone. We thought it would be fun to introduce it to them during March Madness and by having it as part of this $5 Lineup, it will lower that barrier of entry for them to come try it,” Radley also said. This is the third year Pizza Hut is the Official Pizza of NCAA March Madness.